There are different ways to teach kids about the world around them. Aside from the Web opening up the world to them, books still matter. It is a different experience reading books, which kids can flip through every page, filed with photos, worded content and facts. Books like the National Geographic Kids Almanac 2015 can help enrich a child’s mind with different facts. The National Geographic Kids Almanac 2015 features rich photos and facts separated into ten different categories- Amazing Animals, Awesome Adventure, Culture Connection, Fun and Games, Your World 2015, Going Green, Super Science, Fun and Games, Wonders of Nature, History Happens, and Geography Rocks. Each category comes with rich photos to come with interesting facts and figures to teach kids more about the world around them. There are more than 500 photos kids can check out in over 352 pages of enriching content. 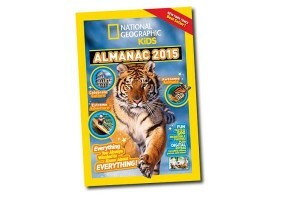 Ideal for kids 7 years old and above, the National Geographic Kids Almanac 2015 is available at Fat Brain Toys for $15.